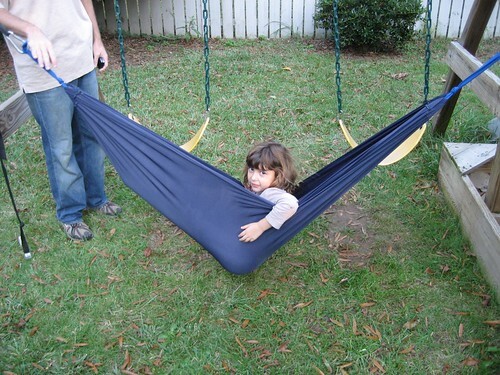 Hammock is designed for children up to the weight of 40 lbs. The cocoon-like design provides a total body pressure that not only feels good, but builds muscular strength, coordination and balance. Being suspended creates a heightened relationship to gravity, which stimulates the vestibular system responsible for balance and coordination. 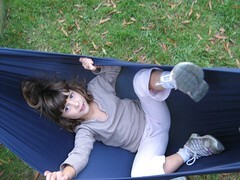 After moving or resting in an lycra hammock a child will feel more alert, relaxed, and . Tactile/ Whole body, deep pressure (enhances dopamine receptors in the brain that results in better focus, motivation and impulse control ) Can be used by OTs when calming a children in therapy who have Asperger syndrome pervasive developmental disorder (PDD) or autism spectrum disorder (ASD) The elasticity of lycra fabric helps establish body boundaries and bodyself development which contributes to self esteem and spatial awareness. Vestibular, Sensory/Motor and Sensation Slow movement activities in an Lycra Hammock are calming and organizing for the nervous system. Well-modulated vestibular activity is very important for maintaining a calm, alert state. An under active vestibular system contributes to hyperactivity and distractibility. The hammock stretchs and is recommend for up to 40lbs. Set up hammock so that when used a foot of the ground. 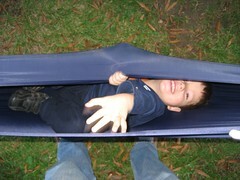 This is important incase during swinging or when getting out of hammock child will not fall on ground. Hammock has webbing that is 3 feet long to attach to tree or swing set.